If you’re like most guitar players, you’ll do most of your practice sitting down. It’s important that while sitting that you use good posture – sitting up straight with both feet on the ground. You can even try using a foot stool to help lift your right leg up a bit so that the guitar sits up a little higher. The key here is to be comfortable and ergonomic. If you try practicing for long periods of time with your legs crossed, or slouching, and you’ll start feeling it, possibly even develop an injury. The convention for rock guitar players, whether acoustic or electric, is to rest your guitar on top of the right leg’s thigh when sitting. 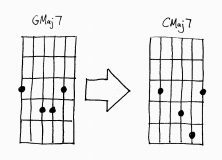 You will occasionally find players that will rest the guitar on the left leg, which is fine, but it can be a big adjustment when you try playing standing up if that’s what your used to. Hug the body of the guitar with your strumming arm close to your right side, not flat against your stomach. If you do it right, the neck of the guitar will be pointing out, away from your body at about a 45 degree angle. This will give your left arm plenty of room to move around and create easier access to the higher frets. You don’t want to be jabbing yourself in the side with your elbow while you play. Whether sitting or standing, make sure the neck of the guitar is either parallel with the ground or pointing up slightly. The real key is that the neck be above the left elbow to allow for a good fretting hand position and to avoid over bending the wrist. 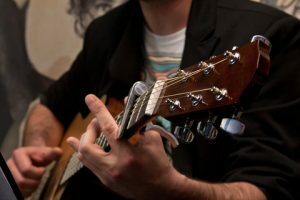 Playing with a sharp bend in the wrist is ok from time to time when attempting big stretches or awkward chord voicings, but should not be the default position. If you find yourself doing it a lot, get the neck up higher! Strive to keep the wrist straight most of the time; a slight bend is ok. I can’t imagine a scenario where bending the wrist upward is helpful, so avoid that as well. When standing, adjust the length of the guitar strap so that the guitar sits at a comfortable height. This is different for all guitar players but again the key is that the neck of the guitar be above the left elbow. The neck will probably point up a little bit more too when standing. There’s a lot of confusion out there amongst the less experienced about where to put your thumb when playing. Let me dispel one myth right now, it is ok to put your thumb over the top of the neck! Just not all the time. The placement of the thumb sets up everything about how the fingers approach the strings. I think there are two general types of hand positions that are useful when playing guitar. Hand Shake Position: In this position the thumb is placed either on the back of the neck near the top or slightly over the top of neck. This places the hand in a more sideways position, like in a handshake. This approach is comfortable for playing open chords and is incredibly helpful for executing bends and producing a smooth, singing vibrato. It’s also just fine for lead playing, especially in blues, or whenever things like speed and dexterity take a back seat to feel and attitude. Palm Up Position: With the palm facing up the thumb is forced to the back of the neck and should rest somewhere near the middle. If done correctly, the thumb’s print should make good contact with the back of the neck, probably with a slight twist towards the inside. This position is good for fast leads, legato shred, big stretches or anytime when dexterity is demanded. 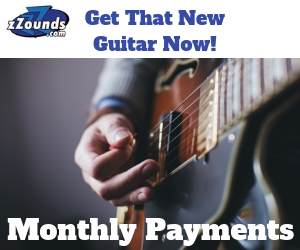 It’s also the more comfortable way to play most barre chords. No matter what position you’re using, I think it’s good practice to leave plenty of space between your palm and the neck. The baseball bat style grip can feel comfortable, especially on fat necks, but I think it hinders dexterity and efficiency. 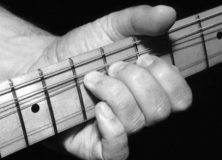 With the palm up position, your palm should be well below the neck to allow your fingers to extend and curl around to the fretboard and allow the tips of your fingers to fret the strings. Picking is probably the most personal aspect about any one guitar player’s technique. How you attack the strings really affects your tone and dynamics. Picking is a little different for everyone. The best instruction I can give is start by holding the pick between your index finger and thumb, and the rest is up to you. Or you can forgo the pick all together and go finger style. 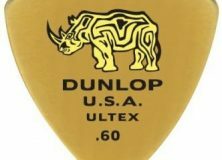 Players like Jeff Beck and Wes Montgomery didn’t use picks most of the time, and that suited them just fine! How you pick is really dictated by the style of music you play, so if you’re really struggling to figure out what’s best for the music you like to play, study your favorite guitar players and see what they do. Luckily, we live in the age where almost any video is just a YouTube search away. Guitar Picks, Which One is Right For You? Ive been playing guitar since I was a Teen .Im now 63.Now weve all heard those songs which we want to play exactly.To do that and realizing you cant cheat your way through instrumental classics you may have considered TAB.Now TAB for the unitiated are written as lines of music.Each line represents a Guitar string which saves you understanding traditional music arrangements AND THEN finding the chords.Lots of Work unless you studied classical guitar.TABS are also habit forming and you get better and better at reading TAB.TAB was written FOR guitar while regular music arrangements were basically written for piano.Try tab.It will be hard at first but get easier and easier as you go on. For those tough breaks and instrumental you will be miles ahead. TAB is great. It’s more intuitive than standard notation. It’s been around a long time too. A lot of early lute music was written in TAB and not standard notation. Some people scoff at TAB it because they feel all musicians should learn to read music. While I agree that learning to read music can be helpful in one’s understanding of music as a whole and provides musicians of all instruments a common language with which they can communicate, these days guitar players can accomplish a tremendous amount without ever learning to read a single note. Nice article! I agree with all of it, especially minimizing wrist bending and lifting the neck up to straighten the wrist out. Good stuff!